Khant Chaw is a 16 years old boy, diagnosed with a congenital heart disease. He lives with his parents and two siblings in Thi Taw village in the Ayeyarwady Division in Burma. His parents work as farmers, and make about 150 000 Kyat (150 USD) a month, which is usually enough for every day expenses. Occasionally they have to borrow money from their cousin for the cost of food and the children’s education. 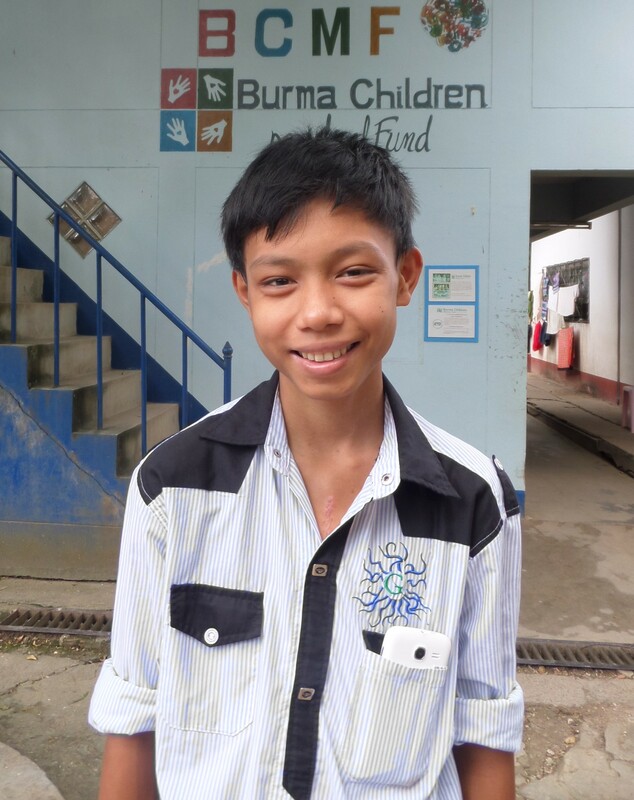 Upon entering 9th grade, Khant Chaw had a fever and experienced fatigue, so his mother took him to the closest private clinic, 6 hours away. The doctor told them the boy has a heart problem, and suggested they go to Rangoon for treatment. They couldn’t afford to do that and decided to try Traditional medicine instead. But with no improvement, after 12 months, and with breathing difficulties, his mother took him to Rangoon, where they were advised that surgery was needed at a cost of 700 000 kyat ($700 USD). His parents were very sad, and did not know what to do next. Eventually they learned about Mae Tao Clinic (MTC), and travelled there for help. He was referred to Mae Sot Hospital (MSH) for an echocardiogram and the diagnosis of VSD (Ventricular septal defect) was confirmed. He was then referred to BCMF. Khant Chaw went to Chiang Mai with his mother on 1 April 2015 and four days later underwent surgery at Lampang Hospital. Although nervous, he stayed in the hospital by himself, and his mother stayed in the patient house in Chiang Mai. Following surgery he was discharged on 12 April 2015 to Chiang Mai, and went back to the hospital for follow-ups afterwards. The doctors and nurses were nice to him; Khant Chaw however couldn’t understand Thai so communication was limited. Luckily a befriended fellow BCMF patient was on the same ward so they could chat and share meals together in the hospital. While Khant Chaw was hospitalized, his mother stayed in the patient house. After she got to know the place and other patients better, she made friends, and did the cleaning and cooking with them. There were nearly 20 people staying there. Khant Chaw, his mother, and family are all very happy that he could eventually get the surgery. His mother says she had been very worried about the cost and Khant Chaw had also been worried because he used to get tired easily. Now, Khant Chaw is feeling much better and is looking forward to going back to school. His mother is pleased to see him well again. She is so thankful for all the support received with the medical bills. She looks forward to saving to pay for their children’s education. Kaunt Chaw wrote a thank-you letter in Burmese. The BCMF staff translated as follows.